It has been five months since my I launched my online store, Quatrefoil Design, and my team and I have already sold framed intaglios from coast to coast! (Click here to see our original intaglio post launching the store.) All of our customers have been thrilled with the quality and beauty of the framed intaglios; the prices are also amazing. During a recent visit to an antique store in town, I noticed that many of our competitors’ framed intaglios were priced at $500 and up. Ours are less than half that price. In response to designer and customer requests, we quickly added a new frame finish to our line up. In addition to the gold finish and the silver finish, we have a new finish that we call ‘gilver’ – the perfect middle ground between silver and gold. To create the gilver finish, the frame is first hand gilded in silver, then a warm translucent gold wash is glazed over it. The intaglios are mounted on an off-white mat, and have a light glaze on the intaglios for subtle contrast (and to give the look of age). Although we love all of our finishes, the gilver is so versatile – it goes in just about any setting, any color scheme. Here is an example of the ‘gilver’ finish. This is a large size (17 5/8" x 21 5/8" outer dimensions) in the Laura design; any of our designs seen in the store can be made in large or small (12 3/4"x 16" outer dimension) standard sizes, with either the gold, silver, or gilver frame. 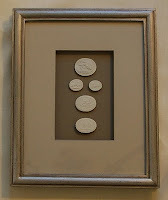 The the 'gilver' frame, the intaglios are mounted on off-white mat, and are very lightly glazed for an aged appearance. Here is a close up of the "Ansley' design with our gold frame (all designs are available in any of the frame finishes). The intaglios are lightly glazed for an aged appearance. A close up of our silver frame with the medium gray inner mat, light gray outer mat. The intaglios are white for maximum contrast. This is also available with white outer mat. 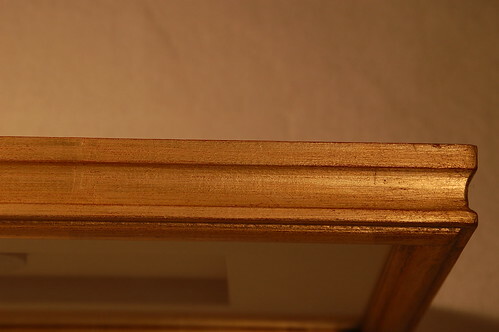 We carefully designed the frame width so that it can be hung in a hall, and the frame does not stick out too much; but it can also be hung in a position where it is being viewed straight on. We have finish and mat samples available through our store (click here), as many customers like to see the specific color before ordering. From left to right – silver, gold, and gilver. One of our first orders was from one of my all time favorite bloggers, Gina from Willow Decor. She lives in a beautiful home in New England, and had been searching for the perfect thing to put above her antique Swedish settee. Gina’s order was custom all the way – we even developed a special frame finish for her that is gilver leaning towards gold (it is not one of our standard finishes, but can be made on request). Gina sent us a bolt of 100 year old Belgian linen to mount her intaglios on; the result was better than we could have imagined (mounting on customers own material is a 10% upcharge, and we request that a sample of the material is sent to us first to evaluate whether it is suitable for framing). Click here to read Gina’s blog post on the intaglios and her lovely conservatory. This is a custom grouping that we developed, with a subtle neutral mat with a taupe tone that nicely contrasts with the intaglios. 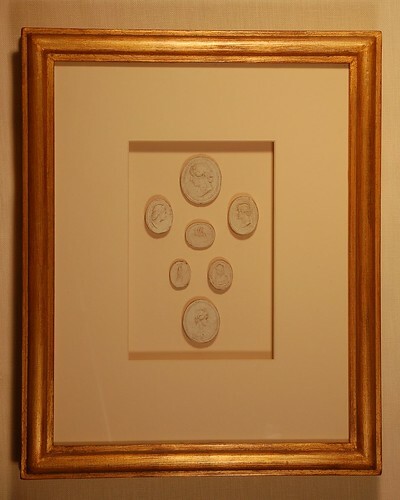 The mat color was selected specifically to harmonize with the ‘gilver’ frame, which was used in this grouping. The scale of this grouping was designed to be large and dramatic, perfect as a focal point over a piece of furniture. Also important to note is that there is a tremendous amount of variety that is possible in the intaglios themselves. For example, we had another client who ordered a similar configuration, but specifically requested no oval intaglios. We can also do this arrangement on a slightly smaller scale. Some of our best customers have been fellow bloggers. Joni of Cote de Texas recently ordered a wonderful grouping of framed intaglios for a client, as seen in this quick iphone shot from Joni’s client’s hallway. The frame is our gold finish. Since we custom make every order, Joni was able to specify the exact dimensions for the frames, and requested that the mat opening closely frame the intaglios themselves. She also wanted the center frames to contain two intaglios. The result was so beautiful that we are now including it as an offering in the store. 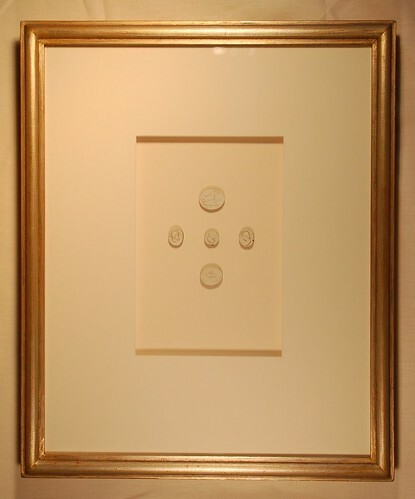 The two larger frames in the center are now called ‘The Joni I’ and ‘The Joni II’. We have called the grouping (a set of 6) ‘The Cote de Texas’ (click here to see the item in our store). We also have a new square size that has been very popular. Our standard square size is 15 3/4" wide x 16" high (slightly higher for perspective reasons), however we can make it larger or smaller according to customer requirements. Another blogger who ordered from us recently is Jeannette; her blog (click here) is a wonderful read, full of inspiring photos and a testament to her passion for design and scrapbooking. Almost as soon as I put the new ‘Joni I’ and ‘Joni II’ in the Quatrefoil Design store, Jeannette put in an order! The picture above shows them in her upstairs hallway, and she created a wonderful blog post about it (click here). Designers and customers, I would love to feature your order on my blog! 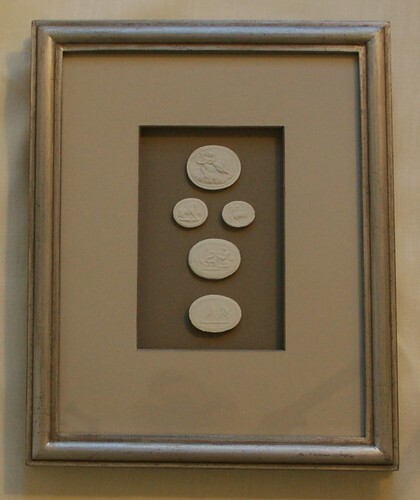 For those of you who have ordered, I invite you to send me a picture of the intaglios in their new home. I am happy to link to any blogs or design firm websites from customers – given that my blog gets tens of thousands of visitors a month, this is a great way to feature either your firm or your blog or both! To visit the Quatrefoil Design store, please visit http://www.quatrefoildesign.com/. We offer a courtesy to the trade, and volume discounts on certain items. We also have special stocking dealer pricing. Please feel free to email with any questions or inquiries – thingsthatinspire@gmail.com. I also have more detailed high resolution pictures of any of our designs. Congratulations on your "newish" venture, I love the new finish...it's a choice I frequently use myself:) We loved your pieces so much, we added Quatrefoil Design to our blog's list of favorite online resources. I wish you continued success! I love the new "gliver" frame and matting. Your matting and frame choices for the intaglios are perfect. Choosing matting is such a tricky process, every element needs to work together or else there is a near-miss. Your price point is also amazing. Where have I been living? On another planet? How did I not know this? Congrats! These are all so beautiful, it's no wonder that it's been such a successful endeavor! I really like the new "gliver" finish, but the silver with it's soft undertones is still my favorite. Now, I just need to find the perfect spot to hang a few of these. Beautiful, classic. Of course you're selling well! Beautiful frames! Congrats on your business! I adore the look. intaglios are so special and a wall or grouping is perfect. very high quality matting and framing puts the icing on the cake! Holly the new "gliver" finish is gorgeous -- and very on-trend. I'm a firm believer that how you frame an object or art is just as important as the object or art itself and your team does a gorgeous job. Some of your intanglios are definitely on my wish list! Your intaglios are so beautiful and classic. I love seeing the pictures of them in these different homes. Congratulations on your success. Congratulations on this wonderful venture! The intaglios look gorgeous! Thanks so much for mentioning my COnservatory and Intaglios - You did such a gorgeous job. Everyone who comes in my home comments on how extraordinary they are!! The frame finish is just beautiful! One point to note is that the profile of these frames are very thin, so they easily can be hung over a sofa or in a narrow hallway. So many others that I have seen are much more shadowbox like and boxy. You took such good care of my linen and I am thrilled how wonderful they turned out!! I must have missed a post or two... thank you for informing us of your business. I will certainly keep your lovely framed intaglios in mind when designin. Wishing you much success! I was just in northern VA and saw the Intaglios I ordered for my client. I had done a scale drawing of how they were to be hung and they look beautiful. I am so happy that this venture is doing well for you! I stay low key about the store on the blog, but will occasionally post when we have an exciting new design or offering. And of course, I love to feature the intaglios in people's homes! These are stunning...such stylish bloggers out there! I loved them on top of the black matte in your original post. Thank you very much for including our hallway in your post today and for sharing such kind words. I am extremely happy with the Joni I & II. So much so that I want to build onto the collection I have begun. It makes such a statement and brings such joy to my eyes whenever I am coming up the stairs. Your post today inspired my post this evening. Intaglios are such wonderfully classic pieces of art. How happy I am that you have a business dedicated to this art form. I can't wait to use these for some of our online clients. I just love Joni's new design. I am sure the new series will be a success! These are beautiful! Congratulations on your success! Wow, these are so lovely! The ones in Willow Decor's really inspire. I also think my new term for a middle metallic is Gilver...love that. The frames are so beautiful. it looks so neat. The frames are perfect for the house in the living room. I love it. I really love these! Was fun to see them featured on Willow's blog- her room is gorgeous and the intaglios worked perfectly!! you have come up with a great design here. these are clean, architectural, and timeless. I am so happy to have rediscovered your site. I adore the new finish and know you will be very successful with it. These are so beautiful! I didn't know you were doing this, I am going to go check it out now! Gorgeous, gorgeous, gorgeous choices for framing options. Perfect for any application, and look super vintage. Love it, keep up the fantastic work! Simple yet beautiful,elegant, and arangement is fantastic. Thanks to you, my home will soon look more alive. Thank you for sharing this with us!